Samantha joined Furnace Brook P.T. after graduating with her Doctorate in Physical Therapy from Northeastern University in 2009. Samantha competed at the Division 1 level in college as a member of the Northeastern Swim Team, and has a special interest in sports medicine and recreational athletic injuries. Besides being Clinic Manager, Samantha also is the CCCE for all physical therapy internship students at the clinic. 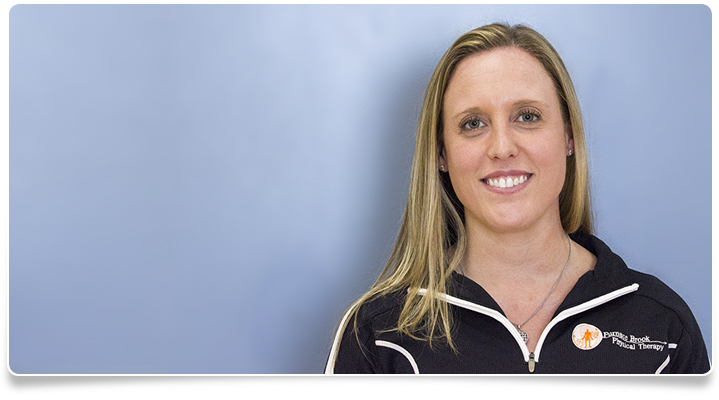 Samantha is a member of the American Physical Therapy Association and is an APTA credentialed Clinical Instructor. She is a certified Arthritis Foundation Exercise Program Leader, In addition, she is certified in Manual Lymphatic Drainage (MLD) and Complete Decongestive Therapy (CDT) following 145 classroom hours from Klose Training and Consulting and runs the Lymphadema Program at the clinic along with Kristen Ross. Samantha became a Certified Strength and Conditioning Specialist in May 2013 and is a Certified Pool Operator by the National Swimming Pool Foundation.